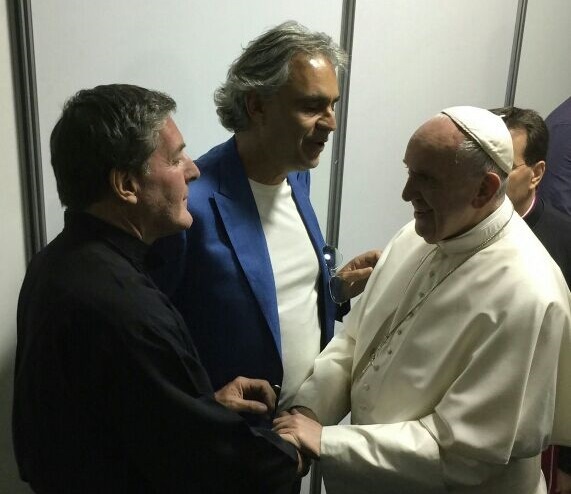 Andrea Bocelli Foundation in Philadelphia for Pope Francesco and the World Meeting of Families. ABF represented by its Founder Maestro Bocelli and his family, have been in Philadelphia for the events dedicated to the World Meeting of Families attended by His Holiness Pope Francesco. Maestro Bocelli strongly wanted to take part in the initiative promoted by the Pontificium Consilium pro Familia. He wanted to be there to offer the gift of his voice, as always, but also to have the opportunity to share this very special moment with one of the families, the Gilles, with whom the Andrea Bocelli Foundation works in Haiti. In particular Jeabets Jn Gilles is the director of the education program of the schools belonging to the Fondation Saint Luc the local partner of the ABF project with whom the foundation started in 2013 a process of systemic development of the poorest and most remote communities of the Island that starts from the conversion of street schools into more functional and safer structures, thus turning them into a reference point, to reach then action on a larger scale like access to drinking water, to electricity, education and agricultural support. ABF and Maestro have, for years, focused attention and commitment in Haiti, where they have had the possibility to know and work, every day, with many other people tying bonds of trust and respect that witness the concept of an extended family, without borders of space and culture, of a global family where the least common denominator may be hope and trust in the others. Maestro Bocelli is thus inviting all of us to open our families to others, because, as Pope Francesco reminds us, “the real power is the service”.